Gene punctuation: Transcriptional termination in eukaryotes. We study molecular mechanisms that define the extent of transcription units in mammalian genomes by focusing on the molecular mechanism of RNA polymerase II (Pol II) termination. Some genes possess G-rich transcriptional pause sites, closely following their polyA signals (PAS). These slow down elongating Pol II after the PAS, so that PAS cleavage followed by Xrn2 exonucleolytic degradation elicits termination (Pol II release from chromatin). G rich pause elements form RNA: DNA hybrid structures (R-loops) that require Senataxin resolution for Pol II termination. We now show that R-loops also induce localised antisense transcripts that recruit H3K9me2 heterochromatin marks via an RNAi-like mechanism to reinforce the termination process. Such genes tend to encode widely expressed housekeeping proteins. Many genes do not terminate close to PAS but instead transcribe well into the 3' flanking region. Transcription of co-transcriptional cleavage (CoTC) elements results in transcript breakage and concomitant Pol II release. Cleavage at the upstream PAS subsequently occurs on released Pol II in the nucleoplasm. We have employed CLIP-seq to show that CoTC-mediated Pol II termination is a common occurrence and may have significant advantage in facilitating gene expression levels. These genes tend to encode regulated often tissue specific proteins. We are carrying out detailed transcriptomic analysis focusing on nascent RNA either isolated from chromatin fractions or by using Pol II IP (NET-seq). These data will clarify the genomic distribution of pause type versus CoTC type termination. We also show that the microprocessor (Drosha-DGCR8) not only excises pre-microRNA from larger Pol II transcripts, but also promotes Pol II termination, especially of independently transcribed lncRNA genes. Our studies on Pol II termination reveal a remarkably diverse range of mechanisms that may be tailored to specific genes classes. Distinctive Patterns of Transcription and RNA Processing for Human lincRNAs. Mammalian NET-seq reveals genome-wide nascent transcription coupled to RNA processing. 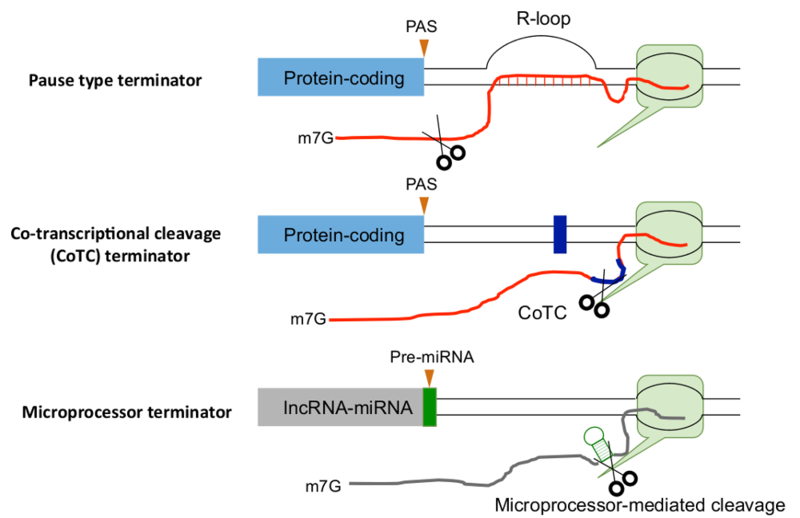 Microprocessor mediates transcriptional termination of long noncoding RNA transcripts hosting microRNAs. Nature Structural and Molecular Biology 22(4): 319-27. Gene loops enhance transcriptional directionality. Human senataxin resolves RNA/DNA hybrids formed at transcriptional pause sites to promote Xrn2-dependent termination. Yeast Sen1 helicase protects the genome from transcription-associated instability. Primary microRNA transcripts are processed co-transcriptionally. Nature Structural and Molecular Biology 15(9): 902-9. Cohesin complex promotes transcriptional termination between convergent genes in S. pombe. Budding yeast RNA polymerases I and II employ parallel mechanisms of transcriptional termination. Genes & Development 22(8): 1082-92. Molecular dissection of mammalian RNA polymerase II transcriptional termination. Human 5' --> 3' exonuclease Xrn2 promotes transcription termination at co-transcriptional cleavage sites. Gene loops juxtapose promoters and terminators in yeast. Transcriptional collision between convergent genes in budding yeast. Cleavage/polyadenylation factor IA associates with the carboxyl-terminal domain of RNA polymerase II in Saccharomyces cerevisiae. Proceedings of the National Academy of Sciences 98(2): 445-50. Multiple transcript cleavage precedes polymerase release in termination by RNA polymerase II. Balancing transcriptional interference and initiation on the GAL7 promoter of Saccharomyces cerevisiae. Proceedings of the National Academy of Sciences 97(15): 8415-20. Intergenic transcription and transinduction of the human beta-globin locus. Transcriptional interference and termination between duplicated alpha-globin gene constructs suggests a novel mechanism for gene regulation. Alpha-thalassaemia caused by a poly(A) site mutation reveals that transcriptional termination is linked to 3' end processing in the human alpha 2 globin gene. Alpha-thalassaemia caused by a polyadenylation signal mutation. Structure and in vitro transcription of human globin genes. The structure of a human alpha-globin pseudogene and its relationship to alpha-globin gene duplication. Molecular cloning of human epsilon-globin gene. Proceedings of the National Academy of Sciences 76(11): 5435-9. 3' non-coding region sequences in eukaryotic messenger RNA. 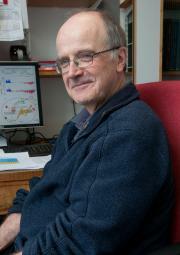 Nick started his scientific career in 1973 at LMB Cambridge when much of its famous science was in progress (e.g. work of Fred Sanger and Cesar Milstein). He worked on mRNA sequencing and discovered the AAUAAA poly(A) signal as a graduate student with George Brownlee . As a postdoctoral fellow at LMB, he began a study to clone and sequence globin genes . This led him in 1979 to take a postdoc position in the USA with Tom Maniatis where he cloned and sequenced various globin genes, discovering globin pseudogenes and structural details about the evolution of the α and β globin gene families in man [3,4]. Nick started his lab at the Sir William Dunn School of Pathology, University of Oxford in 1981 as a Lecturer and then Professor. He was also a Fellow and Tutor in Biochemistry at Brasenose College from 1982-2003. His research initially focused on poly(A) signals, their genetics and biology. From these studies his lab discovered that mRNA processing is coupled to transcription [5,6] which led into detailed analysis of the mechanism and biological significance of transcriptional termination. In particular, they uncovered the molecular process of transcriptional interference [7,10,13], and characterized signals and factors that mediate transcriptional termination of RNA polymerases I and II in yeast and mammals [9,11,12,15-17]. They also discovered the existence of transcription dependent gene loops associated with all tested eukaryotic genes  and more recently demonstrated that these structures function to provide transcription directionality . They were the first lab to discover intergenic transcription in a mammalian gene locus  and also uncovered similar intergenic transcription in S. pombe that leads to cell cycle specific heterochromatin formation and cohesin recruitment . Further studies led to the characterisation of pre-micro RNA co-transcriptional maturation by DROSHA [19,24] as well as establishing the role of helicases (Sen1 and SENATAXIN) in restricting R-loop formation in yeast and mammals [20,21,23]. Most recently they have expanded their studies to investigate the extent of transcription across the human genome using various transcriptomic analyses. This has led to a genomic perspective of how transcription and RNA processing are coupled mechanisms [25,26]. During 35 years at Oxford Nick has had the satisfaction of seeing his research field expand from a relatively small focus into an interconnecting series of topics widely considered to be central to gene expression. He has co-organized from the late 1980s, seven four-yearly spaced workshops at Oxford on “Eukaryotic RNA 3’ ends: formation and function”. These have provided a major forum for the field as it has developed over the last 40 years. MRC Laboratory of Molecular Biology Cambridge UK: MRC Studentship (1973-1975); Junior Beit Memorial Research Fellowship (1975-1978); MRC Scientific Staff (1978-1979); Junior Research Fellowship, St John’s College, Cambridge (1976-1979). California Institute of Technology and Harvard University USA:	Senior Research Fellow with T. Maniatis (1979-1981). University of Oxford, UK: Lecturer then Professor in Chemical Pathology, Sir William Dunn School of Pathology (1981-2003); Fellow and Tutor in Biochemistry at Brasenose College, Oxford (1982-2003); EMBO Member (1982-present); Royal Society/Wolfson Research Merit Award (2002-2007); Brownlee-Abraham Chair of Molecular Biology (2003-present); Fellow of the Royal Society (2005-present). Wellcome Trust Investigator Award (107928/Z/15/Z). 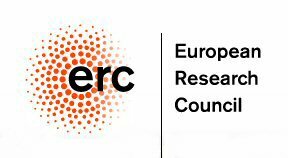 ERC Advanced Grant (339270). Joan was born in Ireland. She worked as a lab technician in the Royal College of Surgeons in Ireland, then in Boston in MIT Chemistry Department and in Harvard Medical School. She came to the Dunn School many years ago and has worked in Nick's lab for most of that time as Lab Manager. 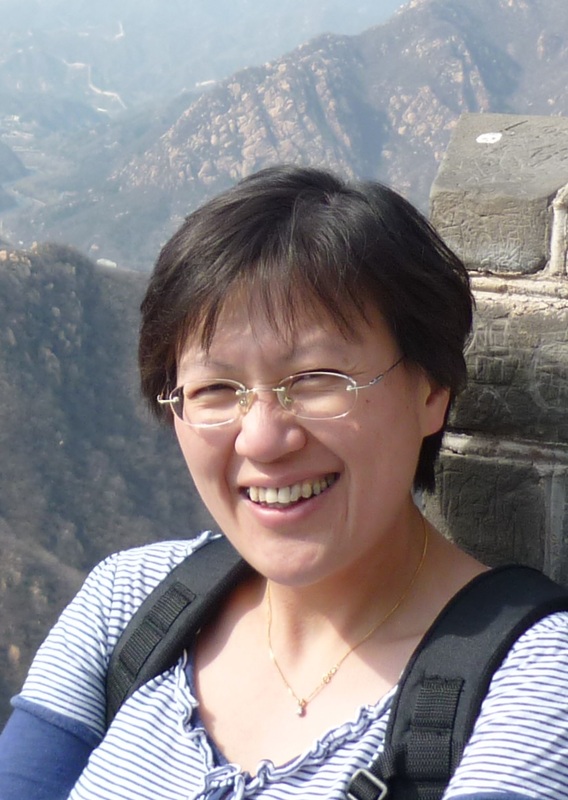 Sue Mei's undergrad days at the National University of Malaysia led her to her Masters at Leeds University. She subsequently did her DPhil at Oxford University with Jane Mellor. She is interested in transcription initiation and directionality. Currently she is investigating the role with which RNA:DNA hybrids play in them. Taka is a post doc from Japan. He did his PhD in Tokyo Medical and Dental University. His interest is nascent RNA life in mammals. He enjoys doing RNA-seq experiments, especially mammalian NET-seq. 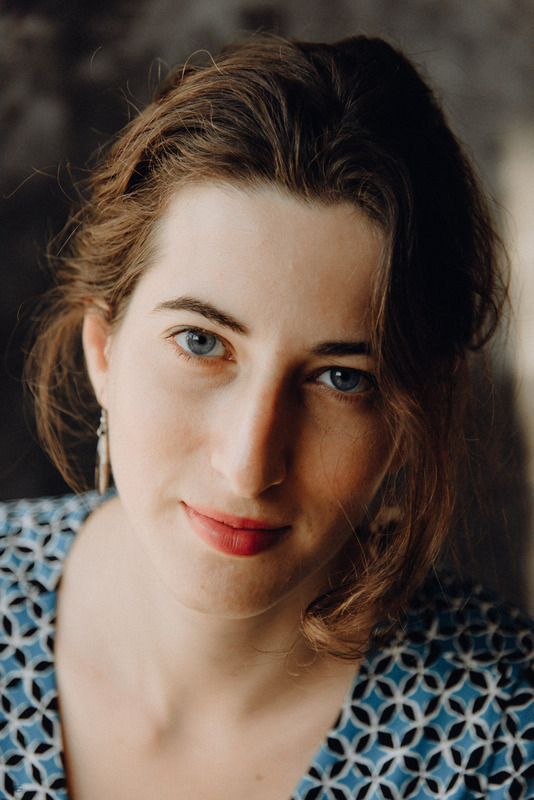 Hannah was born in Hamburg, and studied Biochemistry/Molecular Biology at the Friedrich Schiller Universität Jena and as visiting student with Joan Steitz at Yale University, New Haven. For her doctoral studies she joined the laboratory of Nicholas Proudfoot, and embarked from there on a Henry Wellcome Postdoctoral fellowship, which she took up in the laboratories of Nick Proudfoot, Jesper Svejstrup (then LRI, Clare Hall) and Stephen Buratowski (Harvard Medical School). She is interested in the regulation of non-coding RNA transcription. Ashish has read molecular biology and biotechnology in masters at the Rajasthan Agricultural University, India. He was awarded Junior Research Fellowship by the CSIR-UGC (Govt. of India) to study genetic predisposition to human diseases at the Jawaharlal Nehru University, New Delhi. He did his Ph.D in molecular biology from ICGEB, Italy. 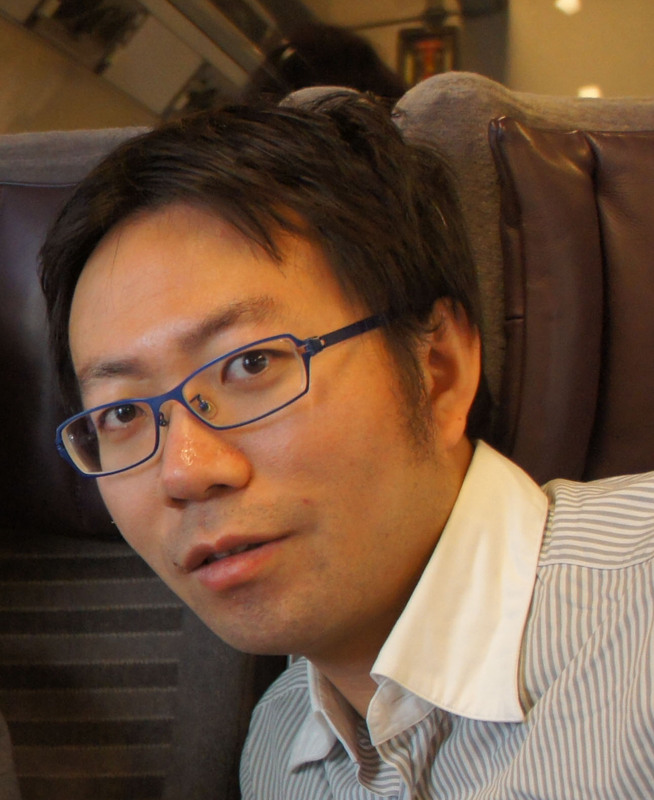 He was awarded the EMBO long-term fellowship for postdoctoral research at Oxford. He has key interests in RNA secondary structure, RNA processing and transcriptional termination in RNA Pol II transcribed genes. He is currently working at the intersection between RNA turnover in human mitochondria and innate immunity. 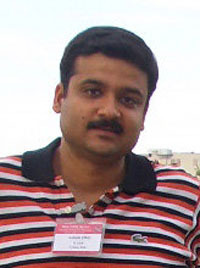 Somdutta is a post doc from India. She has her undergraduate degrees in Zoology and Computer Applications from India. She completed her doctoral studies in Bioinformatics from the The International Centre for Genetic Engineering and Biotechnology (ICGEB, Italy). She is now working on working on various projects involving complex data analysis of RNA-seq, ChIP-seq and GRO-seq techniques in various cell lines to study the long-standing interest of the group in understanding the diverse range of mechanisms of RNA polymerase II (Pol II) termination. Kinga is originally from Poland and has degrees in Biotechnology and Bioinformatics, both from Adam Mickiewicz University in Poznan. She did her PhD in the field of Chromatin and Epigenetics at the Max-Planck-Institute in Freiburg, Germany. She then moved to Oxford to join the Proudfoot lab, supported by a Marie Skłodowska-Curie Fellowship. Kinga currently studies how human gene expression is regulated by a factor that couples mRNA 3' processing with transcription termination. She combines experimental and computational biology. Inna was born in Moscow, Russia. She got her Diploma in Biochemistry/Molecular biology from Lomonosov Moscow State University. During her PhD Inna worked on bacterial antibiotic Microcin C expression mechanisms in Konstantin Severinov lab in the Institute of Gene Biology (Moscow) and Waksman Institute of Microbiology (New Jersey, USA). 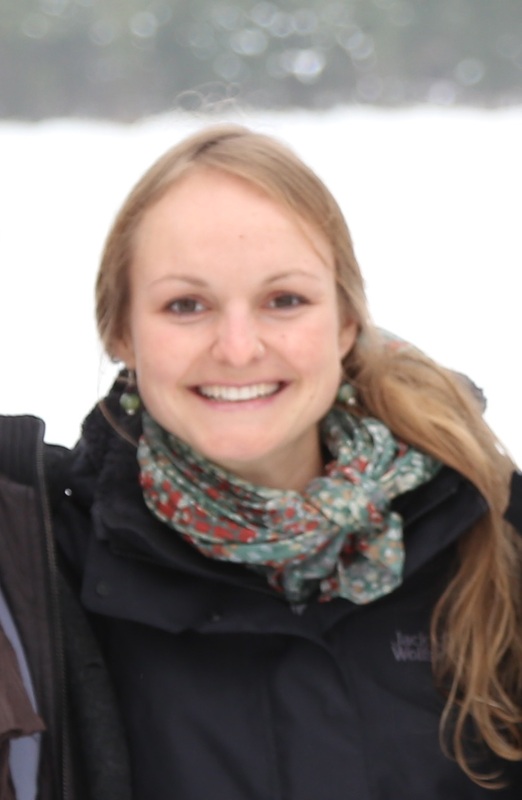 After completing her degree in Molecular Biology Inna joined Nick Proudfoot lab in Oxford as a Post-doc. 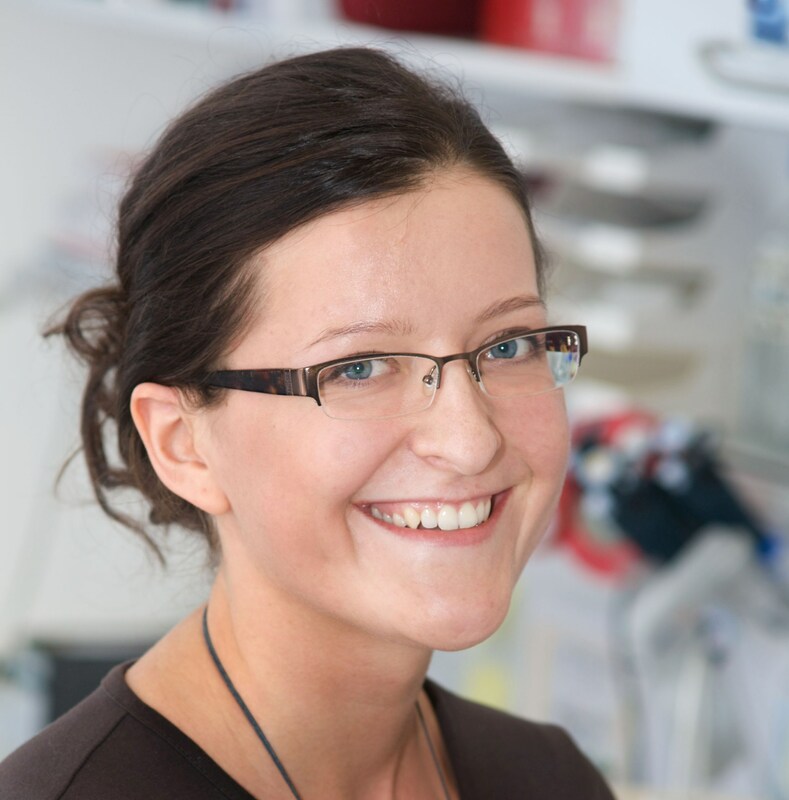 She is interested in details of PolII transcription termination in mammals and was awarded Marie Skłodowska-Curie Actions Individual Fellowship to continue her research. Esther is a DPhil student from Germany. She grew up in Spain and completed her Diplomas in Biology and Biochemistry at the University of the Balearic Islands in 2012. 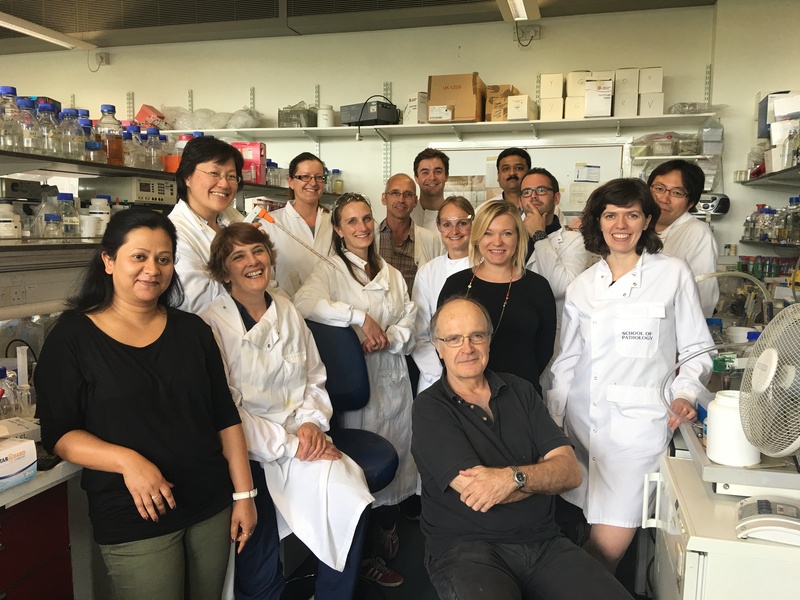 For her Master's degree in Cellular and Molecular Biology she moved to Bern, Switzerland, where she worked on histone pre-mRNA 3’-end processing in the laboratory of Daniel Schümperli until 2014. Currently she is working on her doctoral thesis focusing on the biological relevance of the H2AX mRNA forms. Claudia is now a junior PI at Babraham Cambridge. Claudia is from Portugal where she studied Biology at the University of Lisbon. During her PhD studies at Erasmus Medical Centre (Rotterdam, The Netherlands) she investigated the role of the transcription factor CTCF during lymphocyte development. She was then awarded an EMBO long-term fellowship to further pursue her interest on the molecular mechanisms of DNA rearrangements at immunoglobulin loci in B lymphocytes. As a post-doctoral researcher at the Proudfoot lab, Claudia is studying the role of helicases in Class Switch Recombination. 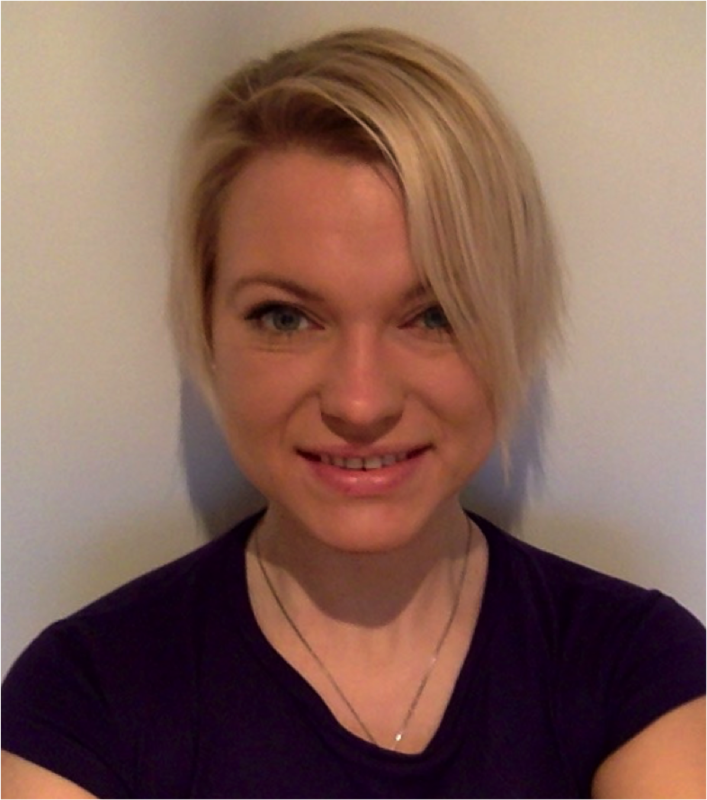 Rita is now a bioinformatician at Indivumed, Hamburg. Rita was born in Russia and grew up in Germany. She has completed a Master of Mathematics (2009, University of Oxford) and finished her doctorate in Systems Biology incorporating bioinformatics and experimental analyses (2014, University of Oxford). She is now working on transcriptional analyses through mNET-Seq.